Last night (4 March 2015) as part of the Kings Place series exploring minimalism the Smith Quartet performed a selection of post-minimalism works from 'European Mavericks'. Composers included Gavin Bryars, Graham Fitkin, Louis Andriessen, and Steve Martland pus a world premiere by Wayne Siegel. 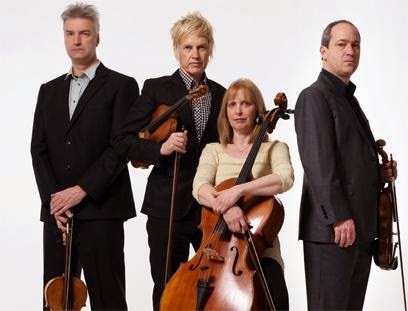 The Smith Quartet, Ian Humphries and Rick Koster on violin, Nic Pendlebury on viola and Deirdre Cooper on cello, have been playing together (with a few changes of personnel) since 1988. In that time they have commissioned more than 200 pieces of music, including works by Michael Nyman, Donnacha Dennehy, Joe Cutler, Tunde Jegede, Gabriel Prokofiev and Jon Lord, and have produced some 24 recordings. They also worked with Steve Reich to record 'Different Trains' for the award-winning film 'Holocaust – A Music Memorial Concert from Auschwitz' which marked the 60th anniversary of the liberation of the concentration camp. Gavin Bryars (1943-) is a Yorkshire man who started his musical career improvising jazz bass. Moving to the America he worked for a while with John Cage, Cornelius Cardew and John White. Returning to the UK, in 1969 he embarked on an academic career, teaching at Portsmouth and Leicester, and it is in this period that his first major works such as 'The Sinking of the Titanic' (1969) and 'Jesus' Blood Never Failed Me Yet' (1971) were composed. His work covers many genres, including a collaboration with Opera North and the Royal Shakespeare Company, another with the Hilliard Ensemble, plus with a host of other big name performers. He has written three string quartets. Tonight's quartet was 'String Quartet no.1 - Between the National and the Bristol' (1985) which refers to a night in 1906 when the dancers Mata Hari, Maud Allen, and Isadora Duncan were, entirely by chance, staying in Vienna at the two hotels of the title. It was dedicated to Bryars' sister Hazel who died while it was being written. From a quiet slow start with a rocking motif, chords became harmonics with atmospheric little swells and falls. Sliding sighs led into a melody from violin and viola. A new discordant idea from violin II and viola led back to material from the start with a languid viola tune. A louder American sounding section developed into strange minor scales and a cello melody. After returning to the rocking, this time with more movement and a gradual transformation of the motif, a sad tune from violin II led into harmonics and scales, ending on a slide. After retuning their instruments, the final rocking and harmonics took on a eerie quality, fading at the end. Graham Fitkin's (1963-) claim to fame began in 1990 when he won the 'Composer for Dance Award'. Since then he has continued to compose for dance but has extended his repertoire. His collaborations extend from community projects to commissions from orchestras around the world (including composer in residence for the Royal Liverpool Philharmonic Orchestra from 1994-6). 'A small quartet' (1993) is the first of six quartets. A contrast to the Bryars, 'A small quartet' was lively with driving, short and long rhythmical elements exploring blues chords and jazzy mildly dissonant harmonies. At only three minutes it is short indeed. Netherlands born Louis Andriessen (1939-) studied composition with Luciano Berio in Milan before returning to Amsterdam to introduce more modern ideas about composition and performance. Over time he has become more eclectic in his influences which can be heard in '...miserere...' (2006-7). He has been a teacher at the Royal Conservatory and boasts Graham Fitkin amongst his students. '...miserere...' began with a conversation between the violins in a descending lachrimae. A rocking motif on viola echoed the Bryars under a violin melody. A staggered attack chord deranged and developed, before a fragmented and argumentative conversation. There was a lovely effect when all the instruments were playing low in their ranges which progressed into a kind of tintabulation before returning to the rocking chorus. This in turn was followed by a section incorporating elements of jazz that became more and more frenzied, until silence and a calming viola solo, then violin. A few spare notes led into sweetly moving chords and a baroque rhythm. Born in America, Wayne Siegel (1954-) moved to Denmark when he was 21 to study with Per Nørgård at the Royal Academy of Music in Århus. A great proponent of the use of electronics he became the director of Denmark`s national electronic music centre, DIEM, in 1986 and was appointed professor of electronic music at the Royal Academy of Music in Aarhus in 2003. In 2013, in recognition of his work in his adopted country, he was awarded a life-long artist's stipend by the Danish Ministry of Culture. String quartet No. 3 'Northern Shore' (2015) however, is acoustic only. It was inspired by his love of the ever changing Danish coastline where he enjoys sea-kayaking regardless of weather. Despite there only being four instruments it somehow felt orchestral – perhaps because of the programmatic, if not cinematic, picture painting. Right from the start shimmering trills evoked light scattering of water. A violin tune was accompanied by frothy spume, which met the solidity of land played by the cello and viola, and became more elemental and urgent with spiccato. More special effects (con legno, shorts bursts of scrubbing, pizzicato) led into a sea change and a rhythmic version of earlier material contrasted with segments of Philip Glass-like arpeggiated minimalism. This section ended with rolling chugging (reminiscent of Stravinsky's 'Dumbarton Oaks') but, breaking free, the viola had a momentary solo before being joined in a fugue. Returning to the chugging, then to the trills from the beginning, a final section of increasing fragmentation brought us back to shore. Steve Martland (1954-2013) wrote 'Patrol' in 1992. He was born in Liverpool and studied at Liverpool University before attending the Royal Conservatory in the Hague where he was taught composition by Louis Andriessen. He then studied at the Berkshire Music Centre in Massachusetts. He tended to write for small ensembles including his own group (the Steve Martland Band) and often mixed classical and electronic instruments. 'Patrol' was, in a way, a break out into classicism, being written just for acoustic strings, and had the conventional form of a three movement format (albeit performed without breaks). Beginning without vibrato the slow movement made great use of minimal movement. Held chords and harmonics drifted slowly through suspensions and incremental tonal change. The addition of vibrato brought about cyclical little figures, each being played with their own period, becoming a perpetuum mobile. This developed further into tintabulation and then to long held chords reminding the listener of the start. Faster music made more of the circling idea, supporting a romantic violin tune, yet still remaining quite static harmonically. As the material was developed it became sparser, leading into a section with accordion-like wheezing of chords under the violins in octaves, before meandering to its conclusion. Defining post minimalism in the context of King's Place series is hard. The Martland, Andriessen, and Siegel were reflective - providing musical summaries of minimalism. Different ideas used by minimalist modern and from history were explored and, in Siegel's case, abandoned – left behind in deep water – as he reached dry land. Fitkin's exploration was solidly in the jazz camp while Bryars found his own level – pushing minimalism into a more melodic sound world. Minimalism Unwrapped continues at King's Place throughout the year.